"'The knowledge of the Atma is the highest among all knowledges'. There are several fields of knowledge concerning this visible objective world - knowledge of physics, of music, of literature, of mathematics, of architecture and sculpture and many more such. However many fields you master you cannot have inner peace until you possess the one knowledge - the knowledge of the Atma; nor can you be happy without it." "The ultimate refuge for man is the Divine Science, the science of the Atma; that is the goal he ought to seek; that ensures final liberation. This Science or Jnana which enables man to become aware of the Unity in Diversity, and the Immortality in Mortality is certainly the supermost." In common with most other Indian gurus, Sai Baba has promised liberation from the cycle of rebirths to a number of his followers... sometimes in private, sometimes in public. That this is a much sought-after boon is perhaps hardly surprising, not least when considering the longing for salvation that is a driving force in much religion, frequently doubtless stronger even than the desire to be physically healed of serious chronic or fatal illness. This makes a bond with very strong binds! at Shivarathri and see the lingam emerge, the eternal bliss of liberation (Moksha). This is not a promise of entering heaven (which is not considered in Hinduism to be other than temporary realms - Svarga or celestial spheres, including the causal plane and the higher realms of the subtle plane, where souls rest and learn between births, and mature souls continue to evolve after moksha). 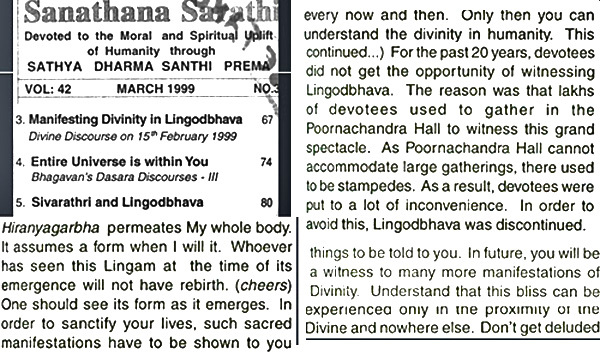 Since 1999, Sathya Sai Baba again produced lingams from his mouth during Shivarathri (after over 20 years of not doing so in public) and has said that all those who see one actually emerging will get liberation. This is a guarantee he had announced on a few occasions during past Shivarathri celebrations and again after the Shivarathri celebrations in 1999. The promise of being free from the necessity of being reborn certainly exerts one of the most powerful psychological bonds there is, in this case to the guru. It has long been part and parcel of the guru-disciple relationship in India. To keep believing in the guru, obeying him implicitly in all things, is apparently most often 'part of the deal', but the guru's promises may only be conditional... for who can ever tell? This definitely applies to Sathya Sai Baba's promises of liberation too, judging by the people I know who imagine they can be granted such a boon, or actually believe that they have been promised it. Baba said: "Another birth is best for you..."
Baba: "Yes, another birth is best. In that you will get total, final liberation"
Hislop: But, Swami, I don't want to go through youth again. Youth is not a good experience - it is dangerous and difficult." Baba: It will be a better life than this one. Don't waste time thinking of the future." (Conversations with Bhagavan Sri Sathya Sai Sathya Sai Baba by Dr. John Hislop. 1996 revised extended edition, p. 227). What does this tell us about Sathya Sai Baba's 'guarantee' of liberation for all those who see the lingam actually emerge from his mouth? 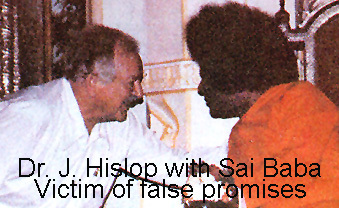 It has been pointed out to me that Sathya Sai Baba - since he is God -can change this or any other promise... that Hislop having to be reborn could even be a boon... if he should accompany Sai Baba's next 'avatar' as Prema Sai. When Hislop had suggested it could be a boon to be reborn with Prema Sai, Sai Baba had contradicted him (in his usual definitive manner) to say it is definitely not so! (See Conversations with BSSS... by Hislop). Nonetheless, two other close servitors who also often saw the lingam emerge, Prof. N. Kasturi and his closest attendant Swami Karunyananda (both now deceased), were both told they would be with Prema Sai in their next incarnations. But a boon is most certainly not how Baba has often and forcefully described rebirth ... which he holds to be the greatest tragedy that can befall anyone, to have to emerge from the womb in painful ignorance of our nature and so to cry 'Koham? ('Who am I?)! Sathya Sai Baba never explains in what liberation really consists other than some kind of a disembodied, transcendent unity with God, so those who bank on it have no idea what it is other than an undefined, unproven limbo. It is remarkable that so many so unquestioningly take all these guarantees as more than hollow boasts and entrapments.... but then most people choose to believe just what they want should be true, even though they don't have a clue what this might involve. However, billions of people - including Muslims, Christians, Buddhists and many another denomination - will obviously never accept Sathya Sai Baba's claims about this, that is for certain. This does not look tremendously positive for Sathya Sai Baba's claims about his effect on world affairs! Sathya Sai Baba has time and again made a great fuss about how "it is impossible for anyone to understand or explain the meaning and significance of Swami." (Sathya Sai Speaks, Vol. 10 new ed., p. 170) and, "In truth, you cannot understand the nature of my reality either today, or even after a thousand years of steady austerity or ardent enquiry, even if all mankind joins in the effort." (Sathya Sai Speaks, Vol II. Old. ed. p. 90). If this is so, how can one really trust anyone who is so non-understandable, so unpredictable? And who makes greater boasts than any person ever known! Good luck to those who can swallow it all, they'll most probably need it, but rather them than I! Sathya Sai Baba is recorded in many books as making promises which he fails to keep. It is usually explained away as being due to the unworthiness of the person concerned, or some other avoidance of the issue (i.e. on his usual down-putting lines like "Don't waste your time thinking about that...") Yet Sathya Sai Baba has himself sometimes tried to explain why he sometimes does not do what he has said himself. He has been asked why he promises an interview next day, but ignores this completely when the time comes. He has done this countless times, as many devotees know. Like many others I met in a Sai Baba connection, I have experienced broken promises by Sai Baba both as regards trivial and more substantial matters. He once promised my wife and I a room in Brindavan when we would be following him there, but no room was forthcoming. As to much more weighty matters, he promised me 'a healthy life' and said to my wife, who was worried about my spinal problems, 'I will look after his health'. However, my chronic back problems have slowly deteriorated, while various other chronic ailments have developed. (Incidentally, this happened long before I began to discover totally unacceptable matters which made it impossible for me to do other than reject Sathya Sai Baba). Why should he promise so much if he doesn't (intend to) carry it out, or can't manage it? Does he wish to play on our hopes so as to bind us to his purposes? A question worth asking, also whether this is deceitful and immoral too! I have sat beside many invalids on hundreds of occasions at his ashrams, and not one of those I knew got better, despite his promises. One young Sri Lankan called Sundaram (married to an Australian lady) who had been promised recovery from serious cancer of the leg died only weeks after returning to Australia (I was sent a letter by his widow). Therefore, Sathya Sai Baba's promises of liberation are clearly worth very little, if anything! If believed in too strongly, they can lead to avoidance of doctors and hospitals with resultant deterioration and death.